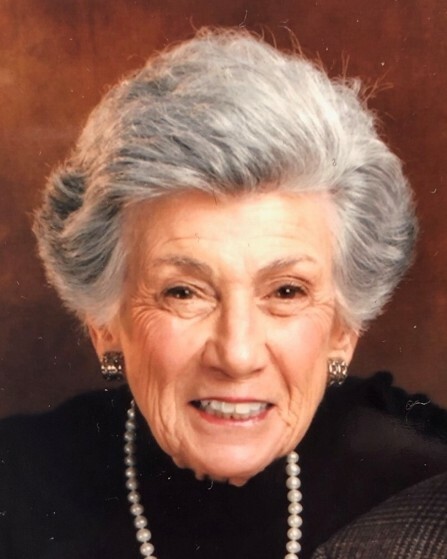 On January, 14, 2019, Joan Seidenbach Berenson, 88, died peacefully at home, surrounded by her children and family. She passed away just 53 days after the death of Dr. Gerald Berenson, her beloved husband of 67 years. Born October 13th, 1930, Mrs. Berenson dedicated her life to family and community, following in the role model of her late parents, Bertha Wolff and Lester Seidenbach. She approached all she did with kindness, generosity, and determination, especially in her commitment to volunteerism. She accompanied her mother at the age of six on service trips to the National Council of Jewish Women’s Well Baby Clinic, and at age ten, she knit and folded bandages to help with the Red Cross’s World War II effort. Mrs. Berenson graduated from Isidore Newman School and went on to graduate from Newcomb College in 1953. While there, she met Gerald Berenson, received a degree in Sociology, and helped to resettle Jewish refugees from Displaced Persons Camps as they arrived by boat from Europe. These early experiences set the foundation for what would become a life of service. She went on to serve in leadership roles for the Jewish Federation’s Greater New Orleans Section. She was the first woman to serve as its Vice-President, the Second woman to serve as its President, and the first woman to chair its General Campaign. She sat on the national United Jewish Appeal (UJA) Women’s Division Board as well as on four national committees of the UJA Campaign. Additionally, Mrs. Berenson served on the charter committee that established the Jewish Endowment Foundation, and later received the 2001 Jewish Endowment Tzedakah Award. During her time as a leader, she firmly championed the equality of women, seeing to it that the Chair of the Women’s Division sat on the National Federation’s Board just as the men had always done. The Jewish Community Center (JCC) gave Mrs. Berenson an award for continuous efforts with the Federation, the first time this agency had ever given such a recognition. Joan Berenson served the National Council of Jewish Women as a volunteer for 82 years. During her time with the organization, she served as Parliamentarian, Vice-President, and President. She marched for civil rights, marched for Soviet Jewry in both New Orleans and Washington D.C., and won the Harold Salmon Sr. Award. She also testified before the Federal Select Committee on Immigration to help resettle refugees from Hungary, Vietnam, and the Soviet Union. She earned the New Orleans Section District Membership Award and won the prestigious Hannah G. Solomon Award for exemplifying the qualities of the organization’s founder. Mrs. Berenson served on the board of the Jewish Children’s Regional Service, which provides need-based scholarships for college, Jewish summer camps, and assistance to children with special needs. Along with her husband, they established three different scholarship funds supporting each of these entities. She served as education committee co-chair and camp chair. In 2012, the Berenson family and siblings were honored by JCRS. She was also selected as the local chair for the American College of Cardiology for three different conventions, which each had over 33,000 attendees. For her work towards securing justice and fair treatment for all, the Anti-Defamation League honored her with A.I. Botnick Torch of Liberty Award. She was a devoted daughter, wife, loving mother and grandmother. Survivors include her four loving children and their spouses: Leslie Berenson, Ann Berenson Goldfarb (Richard), Robert Berenson (Irene), and Laurie Berenson Maas (Dale); nine grandchildren: Aaron Berenson, David Goldfarb (Ann), Stephen Goldfarb (Megan), Andrew Goldfarb, Michael Berenson, Carl Berenson, Julia Berenson, Rachael Maas, and Benjamin Maas; three great-grandchildren: Max Goldfarb, Will Goldfarb, and Gus Goldfarb. The family would like to thank her sitters, Pri Perez, Tonika Hagen, Nikki Hagen, and Jasmine Campbell as well as Passages Hospice. We would also like to give special thanks to Felicia Lamotte for her daily care of our parents, always with a smile, and finally to Margaret Robinson, for her 60 years of friendship and support. Services will be held on Thursday January 17, 2019 at Congregation Shir Chadash, 3737 W. Esplanade Ave., Metairie. Visitation will begin at 10 a.m., followed by a service at 11:30 a.m. Burial will be private.